Alternative economist Christian Felber, looks at ways to put the financial and monetary system on a democratic footing in his latest book launched in the UK. ‘Money, The New Rules of the Game,’ proposes a holistic reform to turn money progressively into a public good, which ultimately increases the freedom for all in society. It offers alternatives to the key issues of money creation, central banks, loans, stock markets, tax justice, pension security and the international monetary system. Christian is well known across continental Europe as the founder of the Economy for the Common Good (ECG), which advocates a more ethical economic model, in which the wellbeing of people and the environment become the ultimate goal of business. This fast-growing movement, supported by more than 2,000 businesses and local governments, comes to the UK shortly with the launch of a national membership organisation later this year. The crux of the current financial problem, according to Christian, centres around the ‘reign of money,’ and its perplexity. The author advocates breaking the chains of a financial and monetary system which he cites as multi-dysfunctional and undemocratic, taming the system and ultimately making money a public good. Christian said: “Money should serve us and facilitate our lives as an instrument of the economy. Today we moved far away from this idea. Money governs our life. Christian, 45, is an Austrian academic who has written and co-authored more than 15 books, teaches at several universities and is an international speaker and contemporary dancer. But it is his position as founder of ECG which gives some real traction to the alternative economic debate in the UK. The movement is resonating with a growing number of people, businesses, universities and local governments who are looking for a solution that builds an economy which increases wellbeing for all, not just the few, and puts ethical management and corporate responsibility at the heart of business. 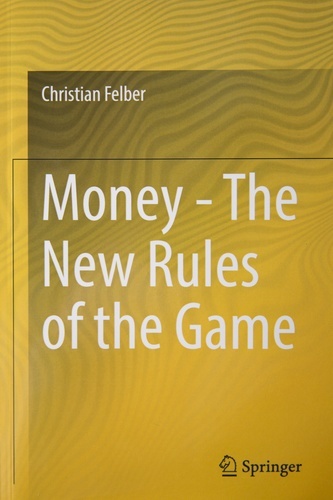 The release of the softback edition of Money, The New Rules of the Game, published by Springer in English, coupled with the ability to source Christian Felber’s previous text, Change Everything. Creating an Economy for the Common Good and the launch of ECG in the UK means that this alternative viewpoint can now be more widely understood here too. Christian Felber collaborated with Clemens Guptara, a graduate of philosophy at the University of Cambridge on Money, The New Rules of the Game, which is available from Springer (UK website) and in (online) bookstores in digital and print versions. Members of the press wanting to interview Christian about the launch of Money, The New Rules of the Game, and for a well-versed commentator on alternative economics, can contact Jane Shepherd on the details below. Shepherd PR can also put journalists in touch with members of the Economy for the Common Good in the UK. Press release issued by Jane Shepherd, Shepherd PR, Ltd. This press release was distributed by ResponseSource Press Release Wire on behalf of Shepherd PR in the following categories: Environment & Nature, Business & Finance, Education & Human Resources, for more information visit https://pressreleasewire.responsesource.com/about.